hrs!! Yes that's right started at 0730 hrs! Sunday morning arrived, very suddenly and very early. My alarm went off at 0500 hrs and I was glad I had packed and checked my kit the night before as none of my motor functions were in operational order at that time of the morning. I managed to force some porridge down and had some breakfast drinks in the fridge ready for the drive up to Southampton which was about an hour away. 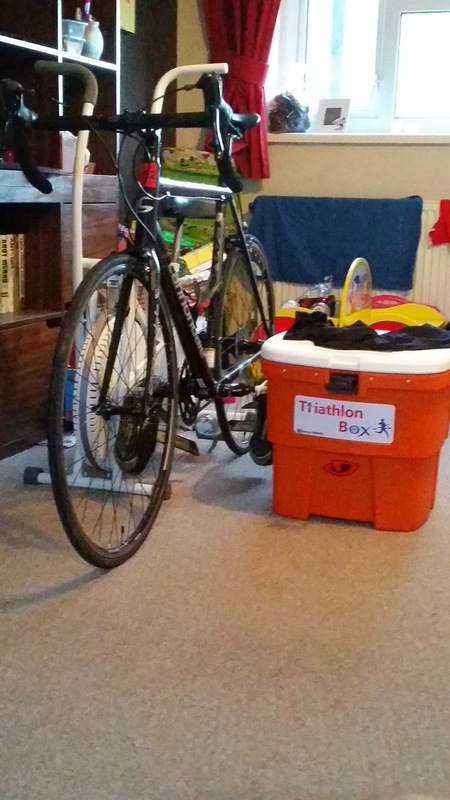 I loaded up the bike and my TriathlonBox and set off about 0530 hrs, still not fully awake! I arrived at the event about 0630-0645 hrs after negotiating some traffic issues and getting a little bit lost. Arriving that little bit earlier than needed was handy too as the event coordinators weren't ready for us either. It gave me a bit of a chance to wake up and take in the surroundings. Once registration was open I went and got my numbers and timing chip. I racked my bike up in transition and made my way over to the pool to get ready to start my 6th challenge of the year! The weather was awful it had been very wet over night and it was bitterly cold but nevertheless the race was about to start. 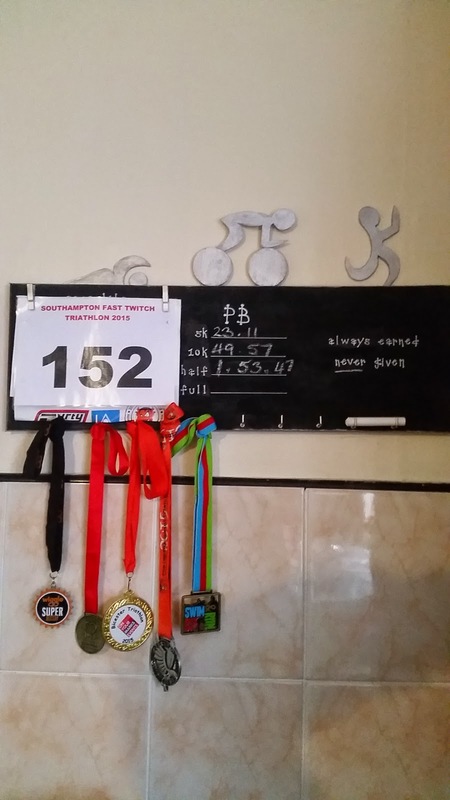 Now by no means would I consider myself a seasoned triathlete but now that I have 3 under my belt the pre-race nerves aren't as half as bad as they were at Bicester for my first. 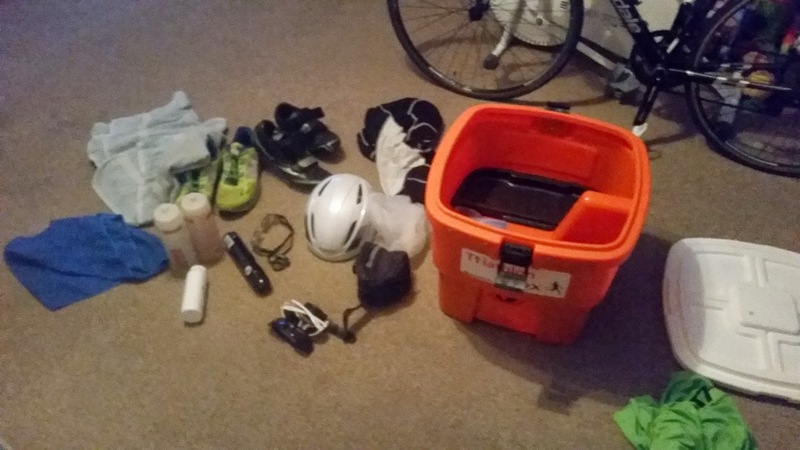 I get more nervous about the race the night before making sure I know where I need to be and when etc. So being stood on pool side getting the race brief from the marshals felt like a standard Sunday afternoon now I was ready to race and the clock was ticking round to 0730 hrs! We were given our lanes and got into the water. 3 to a lane was good and gave us the chance to have plenty of room in the lanes too. I waited for the race starter to give the go sign. 3, 2, 1 GO! I was off. I think the early start was working in my favour as the first 100m flew past and by the 150m point I had passed the other two swimmers in my lane. I caught them both again by the 250m point and was feeling pretty good. Before the swim we were told we had lap counters, but needed obviously to count our own lengths. So when I reached, what I thought was 350m, I was fully expecting the lap counter to show me the float, but NOO! He didn't move! Now I had a choice to make. Do I get out and argue the point later or do I do another 50m and see what happens. I made the choice to swim on, I didn't want to run the risk of DQ! The next time round the lap counter did in fact show me the float. So maybe I had miss counted and had made the right choice to swim on. I opened up my stroke for the last 50 and really went for it! I finished the 50 and climbed out of the pool. I was the first one out! I hit the lap button on my Garmin and checked the time before heading down the metal fire escape steps to transition. It was now i noticed that i had in fact swam an extra 50m and the lap counter had made an error. Still the time was good and I was first out of the pool! Official Swim Time - 00:07:52! As I just said the pool exit was down a flight of metal fire escape steps, which wasn't ideal at all. But as I was first out they were relatively dry. I got down them safely and ran into transition. On went the helmet, followed quickly by my shoes. I grabbed my bike and headed out. Official T1 Time - 00:00:54! I had already had a look at the bike route prior to the event and knew some of the route from the New Forest 100! I knew there would be some lumps and bumps on the way and one small climb in Beaulieu. I got round the first set of roundabouts without any issue, again the early start helping. The last big roundabout led me into the Forest itself and over the infamous cattle grids. Over the first one I went and as I did so something fell from my bike. Something small, small enough that when I looked back over my shoulder I couldn't see anything! I had no idea what it was but decided to crack on and hope that nothing else decided to work loose. The first section of the Forest was up and down and fairly open ground so the wind was playing its part. I managed to keep a high pace of around 34kph which I was pleased with and hoped I could keep up all the way round. I kept looking over my shoulder thinking that the others must be out of the pool by now and out on course but I couldn't see anyone, even over the open ground. The KM kept rolling on the lumps kept coming but they were very short and once they had been passed there was very often a downhill section to recover on. This kept going until about 12km when I got through Beaulieu and hit the one bug hill on the route. My speed dropped to about 13-15kph and the hill was killing me. It was probably only 1km long but it was fairly steep and was sapping my legs. Once at the top the ground leveled out to a pan flat open stretch but now that strong wind from earlier was straight across the front of me and I could not get my speed over 30kph even though I felt like I was peddling for my life. This went on for a good 3km and it felt like forever! Eventually there was some cover and the last 4km was back up to pace but the damage had already been done. My legs were ruined and I was trying to ease my way back to transition to save my legs for the run. Now my legs were really heavy, the bike had really hurt. The run started with a slight uphill along a narrow track through some woods. Thankfully I was the first out on the run and again the early start helped as the track was empty it was just me. At the top of the track a marshal directed me right and I started up another hill, in fact it was the downhill section of the bike on the run in. It was tough, my legs were getting heavier but I was still averaging between 4-6 min/km so I just kept going. This was were I made a mistake! I anticipated that the route would be an out and back. I'd already spotted the marshal that I assumed was the turning point. As the crest of the hill approached I knew the marshal was just over the other side and down a little hill. I had paced myself out to this point hoping that I would be able to open up the legs on the downhill all the way back to the finish. The marshal, as friendly as he was, didn't tell me to turn around and run back. He did however point to the right and made me turn and head up a route I wasn't expecting. Now I didn't actually know where I was in relation to the finish. So i just kept my pace as close to 5 min/km as my legs would let me. Many of the others were heading back in now on the bikes and I was sure that I was going to be passed any minute by another runner. But again as I looked behind me there was no one in sight. As I approached the top of another little hill another marshal pointed to the right and shouted, 'its all downhill from here.' I took that as a hint that the finish wasn't far off now. I opened up a bit and got my time down to under 5 min/km and kept it steady still not really knowing where the finish was. In the far distance I could see another marshal so him/her my next target. Another medal for the rack! I'd done it! I was first out of the pool and first one back from the run! No one had caught me. I was in first place, granted I knew that wasn't going to last but I was in the lead! I was then given my time.....officially 01:16:03. Given how I felt on the bike and how heavy my legs were during the run I was delighted with the time. I was only 3 minutes off the time I set at Portland, which was a shorter bike course too. As I had no one to chase and was pacing myself along a route that didn't exists I was actually over the moon! Whilst talking to the time keeper another runner came home. He was 2 minutes behind me! I was still in the lead!!!! Again I knew I wouldn't stay there but I was still there. I actually stayed in the lead for another 4 or 5 runners and stayed in the top 10 for a while too. But that all changed later on. But I wasn't there to win the thing I knew that wouldn't happen but id done it! 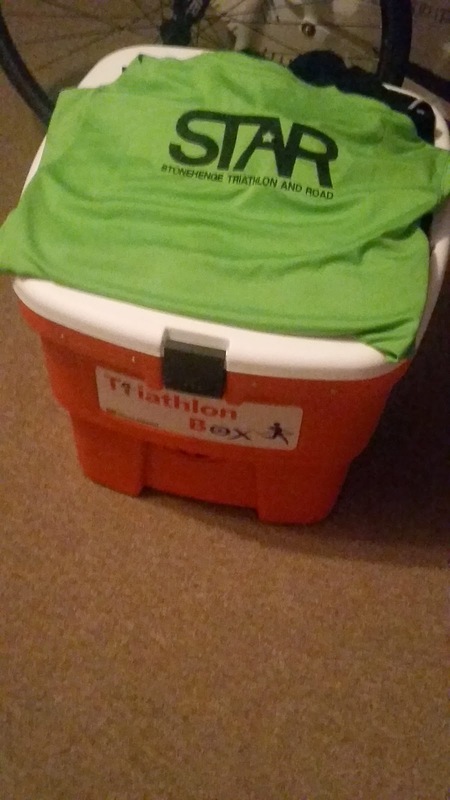 Id finished another triathlon and was buzzing! So half way through my Charity Challenge Year and the support you have all shown has been incredible. At the time of writing this blog I have reached the amazing amount of £1,010 raised for the MS Society! That is also half way to my £2000 target. So please please keep the support coming and the donations too! Challenges 7 and 8 come within 5 days of each other. Challenge 7 is the Winchester Triathlon on 4 May and Challenge 8 is Cycle Wiltshire 100 on 9 May. So to help and show support text KOMS99 plus your donation to 70070 (i.e. KOMS99 £5). Doesn't have to be £5 just £1 from each of you will make a huge difference. You can also donate on my JustGiving page if you'd prefer. The posts will come thick and fast over the next few days and don't forget to catch up on previous races on here and follow me on Twitter (@MartynSeddon) for more updates.